Shame on me! If I were you, I’d be pointing your finger at me in shame with a look of utter disapproval. Why? 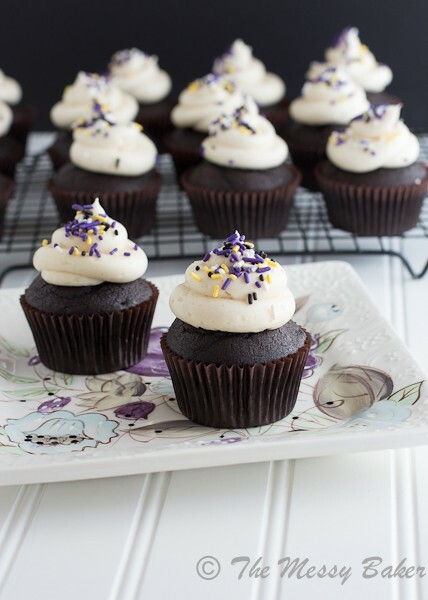 Because it has been far too long since I’ve baked and posted a cupcake recipe. Me! The girl who owns cupcake t-shirts, a cupcake Tiffany necklace, cupcake dessert plates, and the list goes on. Well, the dry spell ends here. Today I plead for forgiveness with these Dark Chocolate Bailey’s Irish Cream Cupcakes. A gift for you, from me, on Valentine’s Day. I stumbled upon this recipe on Tutti Dolci as I was perusing the long list of food blogs that I love. Laura, the baking mastermind behind Tutti Dolci, is a girl that I could seriously see myself becoming friends with. She believes that dessert should come first. I mean, that right there is my life’s motto. Eat dessert first! Laura clearly knows what she’s talking about. I decided to make Tutti Dolci’s Bailey’s Irish Cream Cupcakes for the Super Bowl party that I co-hosted with my girlfriend. Being the queen of adaptation, I made a few minor changes. I made these cupcakes with Hershey’s special dark cocoa powder. The result was a rich, chocolatey cupcake the color of dark espresso. The cake was moist and mildly sweet, creating the perfect base for the sweet Bailey’s buttercream to rest its swirled, fluffy peaks. The buttercream is light and fluffy with hints of roasted cinnamon and toasted caramel. It’s silky on your palette and melts in your mouth. Together, the rich chocolate and creamy buttercream are the perfect Valentine’s Day marriage. Add a few festive sprinkles or grated chocolate to the top and you’re sure to put a smile on that special someone’s face. Now, go smooch that special someone. Happy Valentine’s Day! Preheat oven to 350 degrees F. Line two muffin tins with baking papers. Whisk together boiling water and cocoa powder, cool completely. Whisk Bailey’s Irish Cream into the cooled cocoa mixture. In the bowl of a stand mixer fitted with the paddle attachment, beat sugar, butter, and vanilla extract until pale in color and fluffy. Add eggs and beat well. In a large bowl, whisk together flour, baking soda, baking powder, and salt. Add half the flour mixture to the sugar mixture and beat until just combined. Add cocoa mixture, then finish with remaining flour mixture. Fill each baking cup 2/3 of the way full with batter. Bake for 12-15 minutes, or until a toothpick inserted in the center comes out clean. Cool the cupcakes in the pans for 2 minutes on a wire rack. Carefully remove the cupcakes from the pans and cool completely before frosting. In the bowl of a stand mixer fitted with the paddle attachment, beat butter until light and fluffy. Reduce speed to low and add powdered sugar 1 cup at a time until smooth. Add Bailey’s and cinnamon; beat on medium speed until light and fluffy. Fit a pastry bag with a large round tip and pipe a fluffy cloud onto each cupcake. Sprinkle with grated chocolate or colored jimmies. Store leftover cupcakes in an airtight container at room temperature up to 2 days. For shame, Jennie. But I’ll forgive you for these cupcakes. I only take my booze in dessert form, after all. Hmm…Can I have a couple with extra buttercream on the side? Such gorgeously chocolatey looking cupcakes! Mmm – sounds delish! I once made guinness cupcakes with bailey’s frosting for St. Patty’s Day, but the full-on bailey’s cream sounds even better (especially the caramel kind). Yum! Happy Valentine’s Day! These are incredibly perfect! I love how dark and chocolatey (totally a word) they are!! Yum! Now these would not last long in our house! Love these cupcakes, Jennie! Happy Valentine’s Day! Thanks for a great recipe! I love how dark and dreamy these look! I love Hershey’s special dark cocoa powder but I can’t find it anymore! I used to buy it at the Hershey’s store in Times Square and then they stopped carrying it! sounds yummy! i love bailey’s! I loveeeee Bailey’s! These must be amazing! Yes…shame on you Jennie! You should be making more cupcakes because these are GORGEOUS! You know, I’ve never used that special dark cocoa, but I love the color of these and I bet that really changed the chocolatey goodness here. I’ll have to try that! Love the Bailey’s icing too! These look like the perfect cupcakes Jennie. I love anything chocolate and these look so rich and the light frosting makes them even more irresistible! Thanks, Roxana! I love everything you make. I’m a frequent flyer at your site. Thanks, Laura! I really loved this recipe. Thanks for sharing! Shame on you for tempting us with these delicious, chocolatey, Yummy cupcakes! Chocolate and Bailey’s – what a GREAT combination!!! oh my goodness. These look wonderful! I’ve been searching for a recipe using Bailey’s. I have a huge bottle and there is no way we will drink it all. These cupcakes look perfect! I love love LOVE Irish cream! I thought that these were just going to have it in the buttercream but also in the batter?! Yes! Perfect for St. Patrick’s Day. These sound so yummy! I can’t wait to try them. It’s seem like you would need a larger amount of Bailey’s in the buttercream to get that flavor to really come across, no?! These cupcakes look amazing! I was wondering if you had a suggestion or a different option to using the Bailey’s Irish cream in the cupcake. I don’t really like to use alcohols in baking, so if you had any other suggestions it would be really helpful. I can’t wait to try out these cupcakes.